Movie 43 isn't the only 2013 laughfest brimming over with recognizable stars and A-listers, as actors/writers/directors Evan Goldberg and Seth Rogen have collected all their friends together for an outlandish action-comedy titled This Is the End. Formerly The End of the World, Goldberg and Rogen's movie (which marks their feature-length directorial debut) revolves around a small armada of funny folk and celebrities playing themselves, all brought together for a party at James Franco's house. However, things gets really crazy when Sean Penn arrives the unsuspecting Hollywood denizens find themselves facing a legitimate apocalyptic event. The red band trailer (which, yes, premieres the day before the Mayans' predicted apocalypse tomorrow) includes an introduction that riffs on found-footage titles like Paranormal Activity, with Rogen and Franco hiding out in a bunker (among other things...). From there, we get a taste of the actual movie's sense of humor, ranging from meta-jokes - in a short scene where Danny McBride critiques his fellow foul-mouthed stars' lazy performances - to a montage of comic mayhem that ensures once the world reaches its end. As the world unravels outside, dwindling supplies and cabin fever threaten to tear apart the friendships inside. Eventually, they are forced to leave the house, facing their fate and the true meaning of friendship and redemption. Joining Rogen, Goldberg, McBride and Franco in This Is the End (as themselves) are Emma Watson, Paul Rudd, Jonah Hill, David Krumholtz, Martin Starr, Mindy Kaling, Rihanna, Craig Robinson, Aziz Ansari, Kevin Hart and Michael Cera (whose death isn't considered a spoiler, apparently). The rest of the cast includes extras playing parts like 'Party Goer', 'Cannibal Santa' and 'Hipster'. Yep, this is a Rogen-Goldberg creation all right. Goldberg and Rogen are not-so-fresh off co-penning this year's comedian-studded alien invasion action-comedy The Watch - but, unfortunately, this trailer doesn't do much to sway me into believing their latest collaboration is going to change the trend of diminishing returns from their recent screenwriting efforts. That is to say: This Is the End has a concept with potential and there are amusing moments here (like Robinson's recorded confession), but unfortunately it seems on track to repeat the mistakes of The Watch - including, an abundance of crude jokes and antics that push the boundaries of bad taste (but without much wit) and some cartoony violence that reaches for outrageousness a little too much. It's also hard to imagine This Is the End will offer either the visual ingenuity and/or genre subversion that at least made Pineapple Express and Green Hornet unique, what with this being Goldberg and Rogen's first time calling the shots. Agree/disagree? Let us know in the comments section. 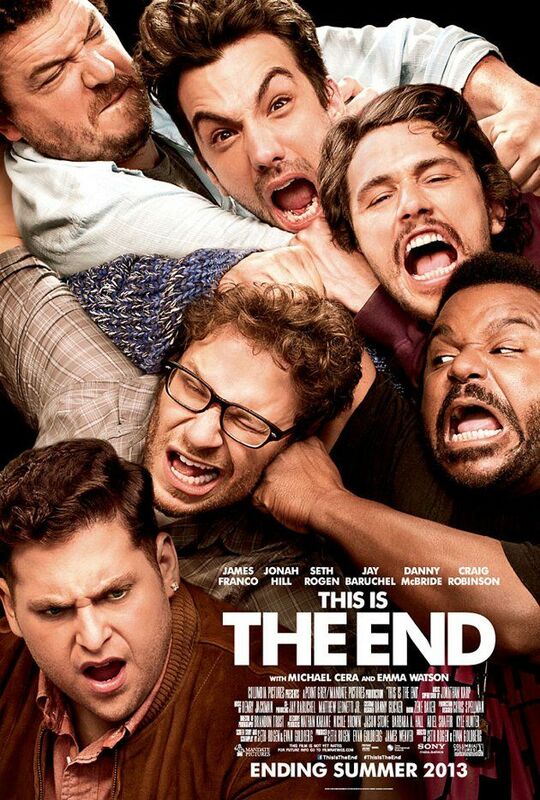 This Is the End opens in U.S. theaters on June 14th, 2013.